A fun, full-color look at everyone's favorite cheese dip, with history, tips, facts, and 50 recipes from beloved food blogger Lisa Fain, "the Homesick Texan." Queso (aka chile con queso) is a spicy, cheesy, comforting cult favorite that has long been a delicious addition to any party, barbecue, or family gathering. This appealing and accessible book features a mix of down-home standards and contemporary updates, from historical, regional, and Mexican quesos to vegan and dessert quesos, including Chile Verde Con Queso, Squash Blossom Queso Fundido, Fajita Queso, Cactus and Corn Queso Poblano, Frito Salad with Queso Dressing, Pulled Pork Queso Blanco, and Sausage Queso Biscuits. Whether you're relaxing with friends, having a few people over to watch the football game, or entertaining a hungry crowd, queso is the perfect party food for good times. Lisa Fain is a seventh-generation Texan. When she's not on the hunt for chile peppers, she writes and photographs the popular food blog Homesick Texan. 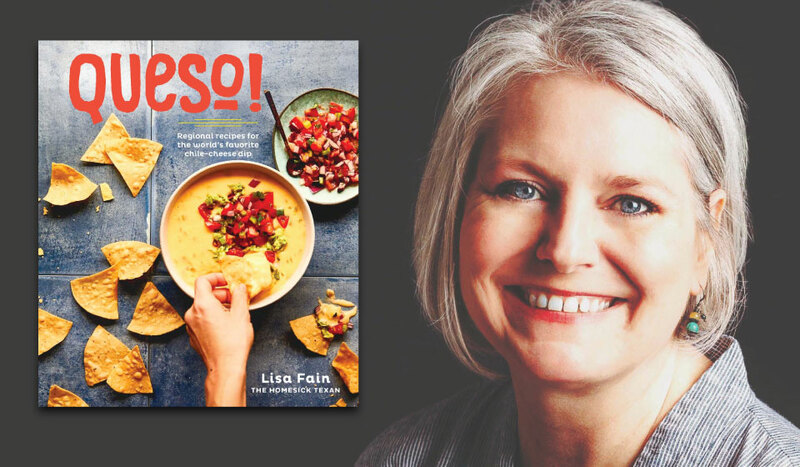 Author of The THE HOMESICK TEXAN'S FAMILY TABLE and THE HOMESICK TEXAN COOKBOOK, Lisa is recognized as a queso authority by Food + Wine, Saveur, and The Dallas Morning News.